One For All Comfort Line 5 review | What Hi-Fi? There's nothing wrong with keeping things simple, especially at the right price. This One For All Comfort Line 5 (also known as the URC 7950) is a case in point. 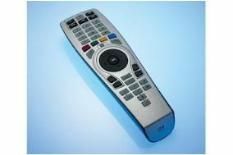 You program it by finding your device's brand in the booklet and inputting a code into the remote. You do a quick test to see if it works – if it does, you're sorted, if not, you try the next on the list. Obviously it's fairly trial-and-error, and of course the remote has no options to setup activities, but for fairly small systems (five devices is the maximum) this is great for £16, especially given how lightweight and comfortable it is in the hand.